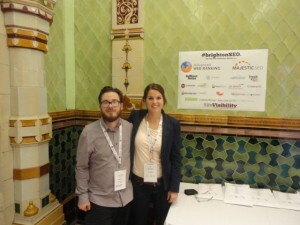 This was my second visit to BrightonSEO, run by Kelvin Newman from SiteVisibility. As the one in March, this was jam-packed full of speakers all with interesting presentations covering every element of SEO you could think of. This was the reason there were 1700 attendees, the biggest number at BrightonSEO so far (hence the line of those in the photo on the right). Once again, Kelvin has exceeded himself with Brighton SEO. A great event and the best part is there are high quality speakers and it is open for all (as it is free). Here is a look at the line up at BrightonSEO, I nearly every session and have tried to summarise most, where I have the presentations, have provided a link to them. 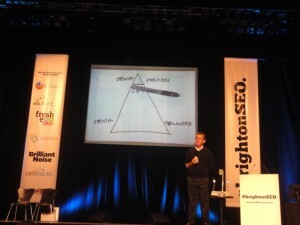 Dave Trott was a great speaker, he did not have any slides and also used an overhead projector, classic. Dave spoke about pure creativity and applied creativity. Pure creativity is what you find in art galleries – it is the theory or art. “Applied creativity” takes that theory and puts it into practice. Applied creativity follows a Form Follows Function basis. If it is going to be practical, it needs to solve the function. In advertising terms, there was £18.3 billion pounds spent on advertising. 89% are not noticed or remembered which equates to £17 million spent on advertising no one pays attention to. Predatory thinking is about changing a problem you can’t solve to a problem you can. How can you stand out against all the advertising messages? The big problem is that people do not understand the media. That is why 89% of advertisements are not remembered. The media is actually the “punter”, the buyer of your goods or services and there are three ways to communicate with them to be effective. These are all in a triangle, with Impact being the smallest and Persuasion being the bottom and largest part of the triangle. You need to stand out if you want to get ahead of your competitors. Dave went on to say it may be hard to be different but you cannot blend in. You need to target one group of people for these advertisements, opinion formers. Do the advertisement for opinion formers who are the ones to stand out and who make 6, 12, 24 followers. The Opinion formers will like the new advertisements and buy the products. Their opinion followers will then copy them and buy the same products and then tell their opinion follower friends and so on. The original iPod was a fantastic invention, it was best way to have 1000 songs on a small device which you could carry around in your pocket. But if you have it in your pocket, how can people know you are listening to an iPhone? Everyone at that time had black headphones and therefore Apple sold the iPod with white headphones. Therefore it was clearly visible to those who had an iPhone or not. The opinion formers liked the fact that they were different by wearing the white headphones and the opinion followers then followed. A great example of how to turn a problem you can’t solve into a problem you can solve. 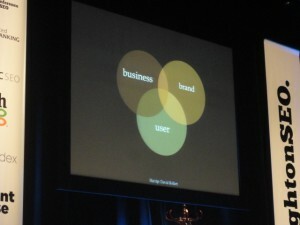 Antony Mayfield gave an interesting presentation about putting SEO in the context of brand marketing. When IT and Ecommerce when not implemented. SEO is not a monopoly, it is about collaborating with others as they are all after the same goal. It is part of PR, UX, Content, Social Media all supported by a common data view. 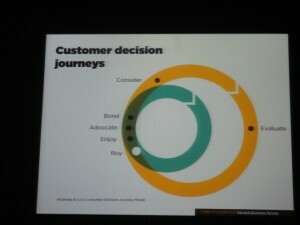 The most useful model to show the importance of search is the Mckinsey and Co’s consumer decision journey model. Search is less about the search funnel. Mckinsey highlights industries may be spending money in the wrong sector. Customers are using search and social media reading reviews before they buy a product. Show the benefits of SEO. What can you do with SEO. One of the problems in marketing is that there is so much going on. The best way to sell in SEO is to get clients focused on what is happening to their customers and what their customers are doing at each part of the journey. Show your clients the McKinsey and Co consumer decision journey model. Stephanie gave an interesting presentation about user experience (UX). UX incorporates the products/services for you business which supports the technology and caters to the user. Stephanie said customers have two reactions to your brand, either emotional or rational. You have to decide what reaction you want for your brand. Great presentation from Stephanie, unfortunately she had to shoot off straight after, but she can be contacted via Twitter @sniffles. Martin gave an insightful presentation about 5 things that make sure that your SEO efforts are part of making a better UX. The summary of his presentation can be viewed on his site. You no longer control the content where your headline will be seen. How does your title grab the attention of the user? You need to craft your headlines and see how it will be shared away from your site which is outside of your context. Navigation and spider ability are important for search engines. The two should be compatible. You need to understand how your users flow through your site. If you have a hot topic section, then try and make sure these fit with the tone of your navigation. Guardian has Culture in their top nav and Daily Star has babes and celeb. There was a craze a while back for carefully sculpting the page rank on your site. This involved having the internal no follow tag to your privacy pages. If you do not want people to look at a page on your site, do not put it up. Speed is really important for Google and people do not tolerate or trust a slow site. SEOs were liking it when Google started doing it as a ranking factor. Having a quick, fast site, Gives you credibility and trust. If your site is slow, invest in this area. Think about your site performance. You have to think about the balance between the UX and SEO. Martin moved the sharing buttons on a page of a website which resulted in a 25% increase in shares. 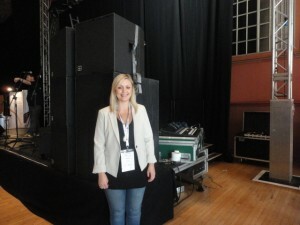 I really enjoyed Beccy’s presentation which was based on a client they had for a 7 month trial. The clients had 52 keywords and wanted MGOMD to improve their rankings during this time through only through link building. Syndicating articles on sites with a page rank of between 2 and 4. They also boosted this with footerlinks and blogroll links. Result – saw an increase in rankings, but this was only short term as there was a Google update which erased their efforts. MGOMD decided to focus on local strategy. They found local pages and syndicated the articles to these sites using exact match anchor text. OMD started do more quality link building. Targeting fewer but higher quality sites instead of lots of sites. They saw their keywords drop from position 2 to position 8. At that time they were using 80% exact match anchor text. OMD did not want to see their rankings change after each update, they therefore went amended their strategy and used a mixture of branded keywords and local keywords in their link building. They also went back to their previous sites they had syndicated to and amended the anchor text. Of the 52 KW, achieved 23, 7 were over target. At end of 7 months, the client was really happy. He knew all results were due to link building. Local links for local pages works. Chasing the algorithm is a hopeless effort – smart SEOs learn and adapt. If best practice SEO is not always possible, do not do it. MGOMD had no ability to change the on page content and therefore they decided not to continue working past the trial as there was no way they could do best practice SEO. 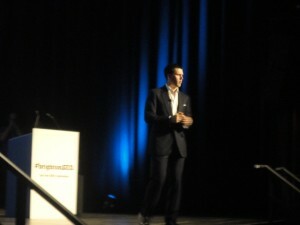 Will Critchlow presented Tom Anthony’s presentation who was unable to make BrightonSEO. Will went through the deck about where the internet was, where we were 10 and 20 years ago. The full presentation is on slideshare. Tom also published the write up of API?WTF? on SEOmoz. 20 years ago we had to make a conscious effort to go online. 10 years ago, we could acess web from more places. But average user was only spending 40 mins a day, now it is 4.5 hours. We can do it anywhere. Where can we go from there? Are we going to spend 48 hours online? Probably not. At the beginning directories was they only way to find good websites. Now the web has evolved and when we are searching for something with an attribute, different results come out, local, video, images, news etc. At the moment, we are at a turning point. We are already explaining to the machine, taking to the robot. In the next 5 years we will see? More computers talking to computers? There is already Google glasses. There is already the Nokia App, augmented reality – integration with the real world, it is talking to another computer. There is also the Amazon app where you can scan a bar code with your mobile. The next questions will be, how do you do SEO for APIs? Richard’s presentation about how to be a better SEO gave some great tips for all those in the search industry. SEO takes a long time master. To stay on top is no small task and it takes a long time to keep your knowledge fresh. SEO Gadget is the result of a dedicated team which has grown to 14 people in the space of a couple of years. The full list of how to be a better SEO are on the SEOGadget blog. @ToastedTeacake The full presentation can be found on the Semetrical blog. In SEO, you need to be the one to influence the business. If you want to be the SEO guru, you need to do something different, Tony summarised to deliver SEO in your organisation, you need to follow these 3 main steps (each with 3 sub steps). Lynne put together 5 lessons which highlighted some of the differences in spelling and the reason why between American English and British English. Lynne is going to present this deck at a few other conferences and therefore was unable to share the presentation. If you are interested in it, please tweet @lynneguist. I really enjoyed this presentation by Lynne, probably because I have experienced this first hand coming from English parents yet growing up through the American school system. An excellent presentation by Aleyda about how to create and optimise a mobile site. Yousaf believes content is not king, it is the kingmaker. Producing shareable and compelling content is not easy or cheap to do, here are Yousaf’s slides from Brighton SEO. We can take a day out to learn about it (we all came to BrightonSEO). You can also achieve a good salary in this industry within a few years. Quality – for a great job and deliver the promise. People – develop and nurture our people. Profit – charge for the value your creating. – including 1 million 16 – 24 year olds who are out of work. SiteVisibility already collaborate – SiteVisiblity, iCrossing and WhiteHat Media. We are working together for WiredSussex for the collective good. This was a really interesting presentation on how to use Pinterest for SEO. Danielle recommended a tool that her company has built called Pinalytics with SEOs in mind. They are currently giving out free data trials. Contact [email protected] if you are interested in taking a trial. Tom Lewis addresses the issue that everybody thinks attribution is a new term, it is not. People know that branded SEO and PPC get a lot of that cake. Tom said the attribution needs to evolve and we should not be limited by the cookie window. It should focus on clustering visits based on delay between interactions. Anna went through 7 useful reports in Google Analytics. Thank you to Kelvin Newman and SiteVisibility for organising this amazing conference. I will come again !! Great summary! 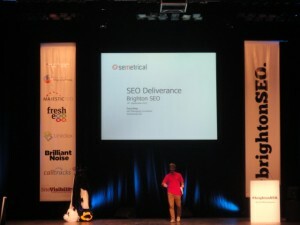 Brighton SEO was excellent, once again! I heard about them during an online marketing seminar in Salford and it works by pairing up web analytics consultants who are happy to donate some of their time with non-profits and NGOs for a short term collaboration. I think this is a fantastic project and exactly along the lines of what Jason was talking about! Hi Briony, glad you liked the summary. Thanks for the information about the Analytics Exchange, I will have a look into them.